October 4th is the Feast Day of San Francisco de Asis. And the FIRST thing I think of when remembering this Saint is what my Mother has learned from him and what she practices everyday, with almost every creature. She calls all creatures Hermano or Hermana. Brother or Sister, respectively. She sees a squirrel, “Hola, hermana ardilla.” And so on, with practically all of God’s creatures, all except the SNAIL! Although it may also have something to do with the word Snail in Spanish. 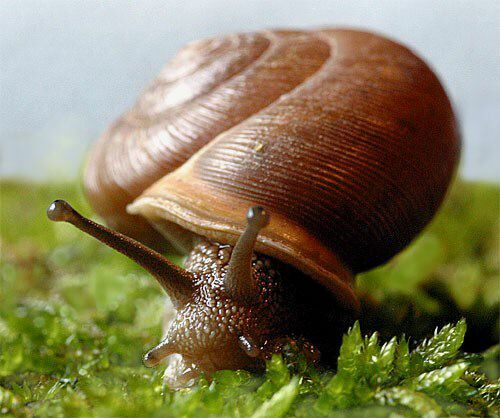 You see, the word is Baboso, one of the words for snail. Baboso also can sort of mean a drooling idiot. It means slimy. It means a fool. It can also be used as a drooling idiot, as I said and that is probably the definition my Mom is more attuned with when she gets mad and says it. You see, my Mom does not curse or swear. She hates it when any of us, her 5 children do. Her reaction, since I can remember has been, “Que bonito. Quien les enseño a hablar tan bonito? Su Mamá? Con esa boquita comen?” And many other sentences like that. Translated, How nice. Who taught you to speak so beautifully? Your Mother? Is that the mouth you eat with? So she does not swear. BUT, when she gets really angry, like when some Moron almost clips her or some other close call, she will say, BABOSO! Of course, we all Gasp! Especially now that we’re grown. We find it hilarious. And it’s cute because my Mom is genuinely ashamed when she says that word. You can see her blood rise, and her ears grow red, it is adorable! Hence, we tease her even more. We still await the day that she will call the Snail her Brother…Hermano Baboso. Francis’s simple, childlike nature fastened on the thought, that if all are from one Father then all are real kin. Hence his custom of claiming brotherhood with all manner of animate and inanimate objects. The personification, therefore, of the elements in the “Canticle of the Sun” is something more than a mere literary figure. Francis’s love of creatures was not simply the offspring of a soft or sentimental disposition; it arose rather from that deep and abiding sense of the presence of God, which underlay all he said and did (Catholic Encyclopedia). Oh, and to find out much, much more about this Wonderful Saint, click here. I have copied the two prayers above; they are so beautiful. 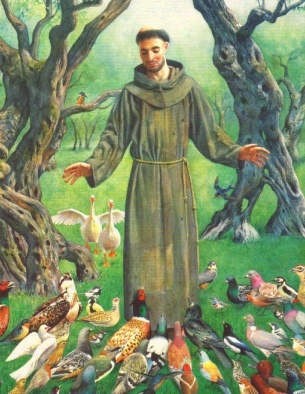 I love St Francis’ love for all creatures! Thank you so much for these posts. Ayer quise hacer un comentario pero el llanto no me dejo. Gracias mihja por recordarme y por lo que dices de mí, soy la madre más afortunada al tener los hijos que tengo. No sabes lo orgullosa que estoy de ustedes, todos tenemos defectos, unos mas grandes que otros pero solamente Dios es perfecto. De nuevo gracias por recordarme, no sabes como me hiciste sentir. Te quiero y admiro mucho Narda eres única mi niña hermosa. Saludos y Dios me los bendiga, besos muchisimos para las bebés por favor. Ahora todos saben de donde lo saque! Gracias, Mami, por tus palabras, tus elogios y más aun por ser Mi Madre (Y NO estoy molesta ;)). WOW! I have got to admit, this made me teary eyed as it did Mom! For those that don’t believe, it is SO true! This was awesome Sis!! You keep up the good work!